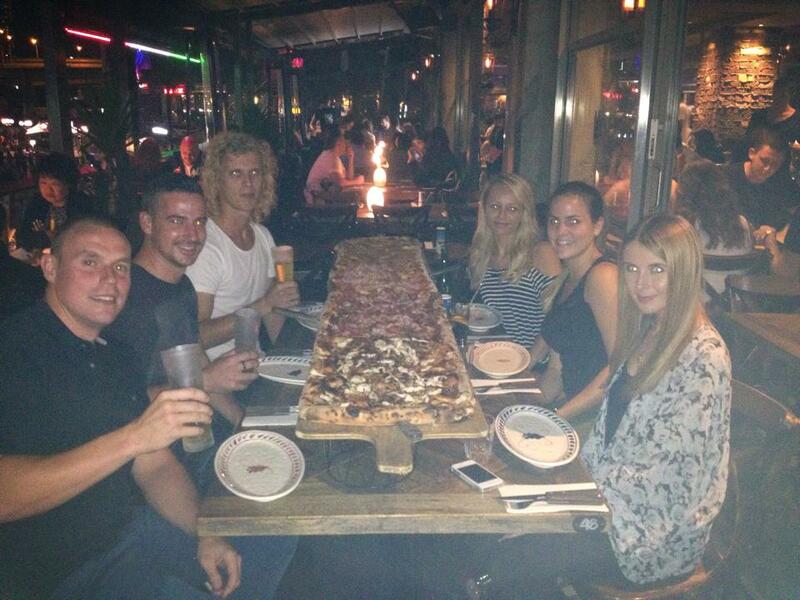 Lifestyle: The 2 Meter Pizza at Crinitis, Darling Harbour, Sydney. Here is a post for all you pizza lovers out there! For a ‘unique’ dining experience, especially for birthdays and occasions, head to Crinitis in Sydney’s Darling Harbour. Not only does it boast harbour-side views and a buzzing atmosphere for all the bars, restaurants and attractions Darling Harbour has on offer, but it also is home to the *drum roll please* 2 meter pizza! I don’t know about you but I for one am a massive fan of pizza – it is a total weakness. So to hear about a 2 meter size of crust, pizza dough and various toppings, along with alcohol of course, is a dream for me! You can have up to 6 toppings on the pizza, but we opted for four – ham & pineapple, BBQ chicken, four cheese and meat feast. The verdict? It was incredible and I shamefully ate more than anyone! Between 6 of us, it worked out to cost $28 dollars each, but you could easily have 8 of you sharing this size which would make it even cheaper.